Taking its inspiration from Virginia Woolf’s homonymous essay (1929), the exhibition A Room of One’s Own is a reflection on the positive value of solitude and its importance in the creative realm. Immersing viewers in spaces that are capable of stimulating various senses, the selected works refer to the conditions sought by each artist in order to nurture his or her creativity, and to the intention to establish exclusive contact with each visitor. The “room of one’s own” thus becomes both the place that enables the artist to create the ideal conditions for expressing his or her research, and the place within which each visitor is invited to partake in an exclusive view and is often stimulated to personally develop the ultimate meaning of each work. Using this theme to bring together for the first time a key group of international artists, the exhibition presents works created specifically for Castello di Rivoli, along with new acquisitions and works from the collection, ranging from the Sixties to the present. Nearly all the works in the exhibition belong to the Museum’s permanent collection, thanks to Fondazione CRT’s Project for Modern and Contemporary Art. With particular importance given to the concept of the “monographic room,” which has been the basis for building an important part of the Castello’s collection, the exhibition also reflects the collection’s specific qualities. he artist’s studio, as a place of solitari reflection and a dwelling place for the creative mind, is a theme that Giulio Paolini (room 18) often investigates. The artist, since the mid-Sixties, has focused his attention on the places assigned to art and to the basic materials of artistic activity. For Paolini, the exhibition moment is also an occasion for new creative ideas. For the exhibition A Room of One’s Own, the artist has conceived an installation that brings together in one part of the room works that range from 1962-1966, the representation of the object that gives the work its title is obtained through the use of silk-screened tissue paper with hand-painted details, 1964 to 2008, offering a precise image of his path. At the center of the room, the artist arranges Stanza 18 (Il momento della verità) (Room 18 – The Moment of Truth), 2008, the work that gives the room its title. The image is structured as an eye socket, through which the artist is seen in his studio, at the moment he takes up paper and pencil. A possible view of the artist’s labyrinthine mind, the work is meant to be enjoyed by one viewer at a time. The encounter between nature and human being is fundamental to Giuseppe Penone’s works (room 19). Referring to an ideal condition of symbiosis, the artist investigates a universe within which a continuous interpenetration takes place between living beings and natural elements. In Respirare l’ombra (Breathing the Shadow), 1999, thousands of bay leaves are contained within a subtle wire mesh, covering the walls of the room. Evoking the moment of encounter between nature and the individual, the work physically becomes part of each visitor, through the simple act of breathing. As one inhales, the scent of the bay leaves enters the lungs, and for each person the sensations and memories that are evoked can differ. The gilded bronze sculpture, in the shape of lungs made of leaves, confirms the uniqueness of the encounter and the possibility of a profound interpenetration between man and nature. Jan Dibbets’s research (room 20) succeeds in transforming images of reality into abstract propositions, presenting images that can be read from various viewpoints. Architecture and details such as floors, ceilings, vaults or windows have constituted the point of departure for entire series of works. In Spoleto Floor, 1981, Dibbets makes a semicircular arrangement of a series of photographs related to details of the paving of Duomo di Spoleto, transforming it in an abstract space, a circle suspended in the act of taking place or of infinitely expanding into the vortex of a spiral. In Barcelona Window, 1989-1990, and Tollebeek Spring II, 2000, Dibbets focuses on windows, elements meant to channel light or oculi, evoking the tension toward a place that is elsewhere, an ideal place that can be reached through the mind’s eye. Electing solitude as an ideal creative condition, Alan Charlton (room 21) has always personally taken care of all phases related to the creation of his paintings considering each moment of a work’s creation to be unrepeatable. The manifestation of a mind that identifies creativity with silent assiduity, he often chooses not to include texts in illustrated catalogues, preferring that the same silence that surrounds the creation of his works remain the condition in which they are enjoyed. Like all the artist’s works, Five Vertical Parts (Two Greys), 2001, is abstract and grey in color. Charlton deliberately reduces the expressive features to a minimum, eliminating every trace of the paint’s application. By selecting from the indeterminate flow of images around us small events or slightly surreal situations, Marijke van Warmerdam’s art (room 22) casts light on their poetic monumentality. Her films, projected in settings in which natural light can stream in freely, feature a cyclical structure, which she achieves by always showing them in continuous loops, with an effect of repetition that makes the recorded events seem more abstract. In the film Roeren in de verte (Stirring in the distance), 2004, the focus is on an interior, characterized only by a cup of coffee placed on a table. A window separates and shelters the domestic interior from the snow that is falling outside. This picture of peace is gradually modified by the unexpected increase in the snowfall. Changes in the weather coincide with the action of a female hand that enters the camera’s field. Stefano Arienti (room 23), reinventing the figure of the scholar bent over his texts, employs gestures of erasure, manipulation or simple folding to remove entire books and volumes from normal sight. Almost as if he were engaged in liberating actions of therapeutic value, his gestures enter into precise repetitive typologies, capable of inserting the original material into a new vital cycle. A university textbook that actually belonged to the artist is the raw material for Organic Chemistry, 1988. Arienti folds the book’s pages and, sewing them together with metal staples, he forms a three-dimensional sculpture. Almost like a game, the book thus becomes a long snake, which can be arranged at will in the space. Intimate and solitary, Marisa Merz’s works (room 24) suggest the presence of secrets that cannot be translated into words. Bordering on the immaterial, they are poetic and anti-monumental. Untitled, 1997, is made up of the outline of a violin shaped in wax and a lead basin that constitutes its sound box. A jet of water passes over the instrument, releasing its voice and dispersing faint music in the space. A system in continuous renewal, the installation seems to invite silence and listening. Alone, inside his studio, at the beginning of his career Michelangelo Pistoletto (room 25) focused his attention on himself, devoting himself to the selfportrait. His works progressed from being pictorial and shiny to metallic, reflective surfaces, thus managing not only to capture the figure of the artist, but also his relationship to the world. As with other works executed during the first half of the Sixties, in Light Bulb, 1962-1966, the representation of the object that gives the work its title is obtained through the use of silk-screened tissue paper with hand-painted details, which is then applied to a sheet of stainless steel, polished to a mirror surface. Opening itself up to dialogue, the mirror surface that characterizes the work is ready to reflect the uniqueness of each visitor, infinitely expanding the images and moments that the work can capture. Even when it is monumental, the art of Claes Oldenburg and Coosje van Bruggen (room 27) stems from the privacy of their living space, which includes their artists’ studio. Simple household objects of everyday use are often the point of departure from which the artists develop their sculptures. Like a playful bundle prepared for a long journey, Houseball, 1985, includes a series of household objects, including chairs, tables, brooms, doors, ironing boards and abat-jours. A portable house, ready to use, the work is the version for the interior of a sculpture originally conceived by Oldenburg and van Bruggen for the performance ,The Course of the Knife, installed in Venice in 1985. It accompanies Georgia Sandbag, the character interpreted by Coosje van Bruggen, inspired by George Sand. A strong tension toward extreme limits is one possible definition of the impetus that animates the work of Paola Pivi (room 28). Apparently dissimilar, her works emerge from a consistent propensity to arrange the elements of reality in absurd and alienatine relationships, almost as if the artist were playing with the world. The five photographs in the exhibition are set in Alicudi, the small island north of Sicily, one of the remote places where the artist has lived for a while. These images, which appear incoherent, are in fact the result of a reality characterized by time that is suspended, separate from banal, everyday existence and open to encounters with the marvelous. Francesco Vezzoli’s early works are tied to embroidery. While transforming it into an art form, Vezzoli (room 29) maintains its characteristics as a solitari and private occupation. Often resorting to the practice of quotation, the artist draws upon auteur cinema, Hollywood films, television productions, art history, fashion and contemporary politics. In Greatest Hits – Milva canta Bruce Nauman “Vattene dalla mia mente! Vattene da questa stanza! (Get Out of My Mind! Get Out of This Room! )” (Greatest Hits – Milva Sings Bruce Nauman “Get Out of My Mind! Get Out of This Room!”), 2005, the artist pays homage to Bruce Nauman. Vezzoli’s work refers to a sound piece created by Nauman in 1968, in which the American artist established the boundaries of his creative territory, using his voice to invite visitors to leave him alone. Unlike the original, Vezzoli’s version is performed by the singer Milva and is intentionally transformed into a dramatic and passionate appeal. According to the principles of linguistics, interpretations related to a single word can be as numerous as the people who read it and pronounce it. While agreeing on the general significance, every work is, in fact, a point of departure for associations tied to personal memories and experiences. Employing language as the material for his art, Lawrence Weiner (room 30) challenges the traditional concept of sculpture, opening it up to the interpretation of each observer. Like the insertion of an argument in which the artist indicates neither beginning nor conclusion, …IN AS MUCH AS / IN AS MUCH AS…, 1972, establishes a dialogue between the artist and each viewer. The idea of the room and that of solitude are intimately connected to the work of Massimo Bartolini (room 31). In his installations, the artist often creates environments inspired by private rooms, interpreted as places whose physicality is translated into a strong abstraction. These works are always conceived to accommodate one visitor at a time. In this way, Bartolini wishes to recreate and share with others the introspective conditions that he enjoys for the creation of his works. In Head n.2 (The Studio), 1997-1998, the artist offers access to a mental space, within which visitors are free to lose themselves in thought. In Cinquante Fifty (Installation for a Parking Lot), 2000, (room 32) Pipilotti Rist’s video camera dwells on an incongruous everyday reality, dominated by disorienting oneiric characteristics, but also by the recurrent solitude of the characters that are described. In part of the installation, the image focuses on the gray façade of a condominium, until the video camera discovers a middleaged woman looking out her window, in the typical attitude of one who is trying to escape boredom. Played by the artist herself, another woman, incapable of leaving the boundaries of her apartment, is instead drawn to the lens and tries to attract its attention. The other protagonist of the installation is a man walking along the edge of a deserted highway. Totally engrossed, he seems to notice neither his own nakedness. Hypnotic music, envelops the isolation of each of the two women and the solitude of the man in the same atmosphere. The result of private, continuous and silent contemplation, Ettore Spalletti’s art (room 33) does not propose defined meanings, but emerges to offer visual and expressive emotions. His research is directed toward an attempt to pin down colors like blues, greys or pink whose nature is, on principle, mutable and indefinable. 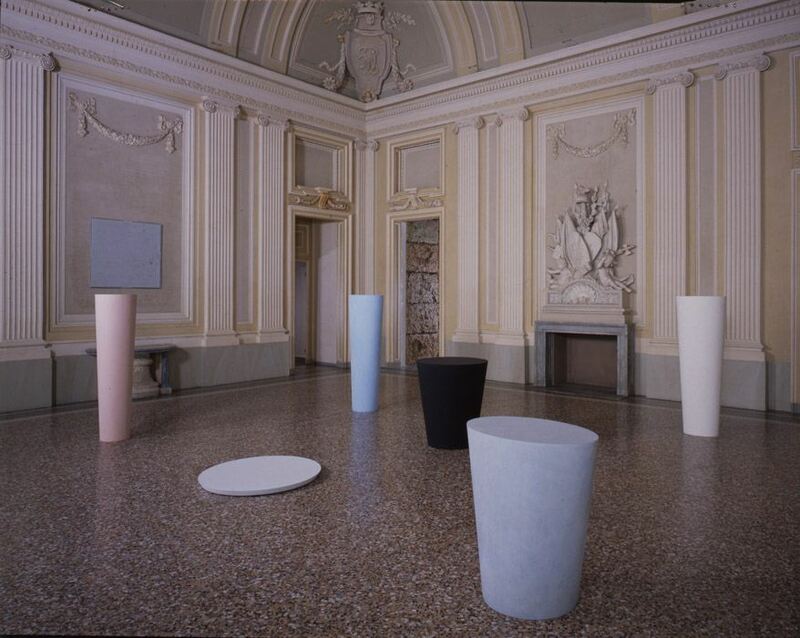 In the work Anfora Bacile, Vasi (Amphora Basin, Vases), 1982, Spalletti is inspired by the primary forms that pertain to human civilization, abstracting them in his own sculptural language. Everyday objects thus become pure forms, whose evanescent nature is reasserted by the impalpable pigment that envelops each of them. A restless traveler, Franz Ackermann (room 6 – first floor) sustains his artistic research through continuous voyages. Each of his voyages corresponds to an equivalent period of pause and meditation, during which the artist, working in the privacy of his studio, works on the great quantity of information he has gathered. Offering visitors a sort of image of his creative universe, the artist has conceived an installation for Castello di Rivoli where the cacophony of the world is accompanied by the hypothesis of a private place. Map of the World, 2007, takes its dimensions from a small garden shed that G. B. Shaw used for writing in solitude. Nicknamed “London,” the shed allowed the writer to claim, without being able to be contradicted, that he was elsewhere. Ackermann’s shed is enriched by a dense grid of drawings, a manifestation of the voyages the artist continually makes. As a shared experience, but tied ultimately to the individuality of each observer, in Olafur Eliasson’s work (mezzanine – Manica Lunga), the act of seeing is the object of continuous explorations. A result of his encounter with the Castello’s architecture, Your circumspection disclosed, 1999, is, in the artist’s words, “an extension of the eye, or rather a machine for seeing.” Structured to transform the visual process into a physically negotiable experience, the installation is a camera obscura, within which it is possible to see reality as an upside-down projection.